In an effort to show more of my process on the blog, I'll be doing WIP check-in posts. One of my goals for 2015 was to work down my WIP list to a more manageable number. While I'll never be a "one project at a time" kind of girl, I was feeling weighed down by the number of (and the age of some of the) WIPs on my list. Of course I didn't spend my year not starting anything new and as of the beginning of October I had 36 projects on my WIP list. It's December which means it is crunch time. I decided to dive in and try to knock out a bunch of finishes in December. I recently knocked some into the done column by working on some low hanging fruit with projects that were nearly done. I'll be showing you those soon. 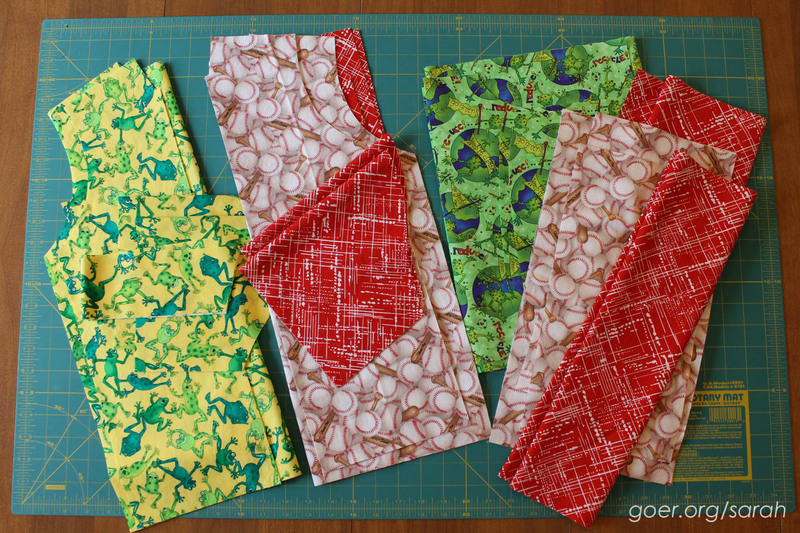 Today I'm showing you what I've been sewing this week. Monday evening I realized that I had ten WIPs on my ironing board that I had been working on that day/evening. Last night I worked on an eleventh. 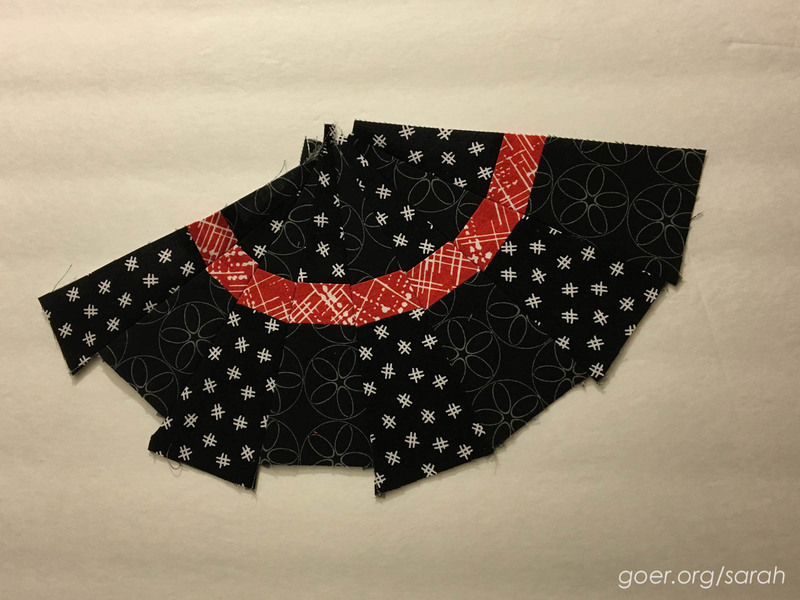 Hanukkah starts on Sunday evening, so I realized that if I wanted to give the kids any of the clothing I had fabric to make, I needed to... um... make it. These are all fabrics that they picked out in June. I'm making my son two bowling shirts (frogs on yellow and baseball). The last one I made him was almost a year and a half ago and is getting too small. My daughter is getting two dresses. Ironically, she chose frogs as well. And she was the one who chose the baseball fabric in the first place. 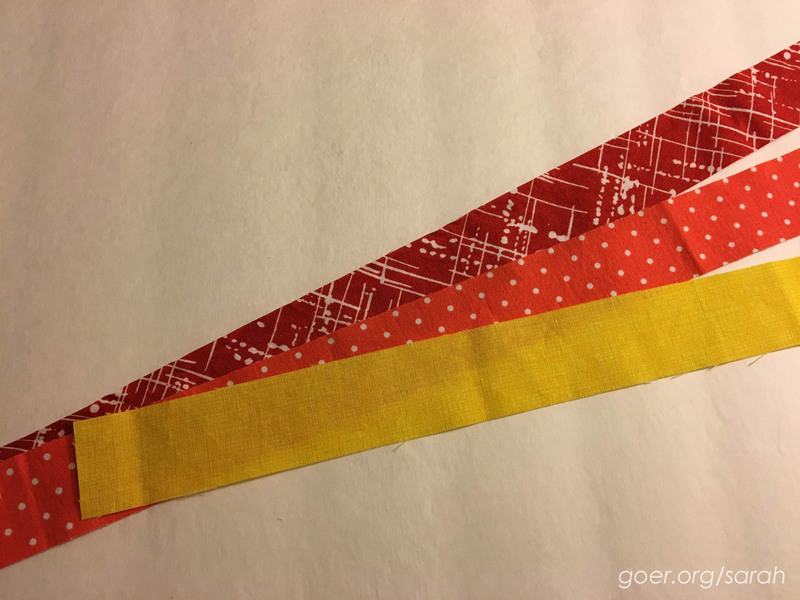 I chose the red to coordinate (and bought extra for my quilting stash!). I'll use the Jewel's Stripwork Dress pattern for her baseball dress, but the skirt will all be one fabric. I have the bodice partially pieced together. It should finish up pretty quickly. I made this style dress long ago for her and she can barely get into it now, so I know she'll be glad to have a new one. Also, she's so excited to be playing t-ball this spring. She's been obsessed with when it will be her turn since watching her brother play last spring. For her frog dress I'll be making my first Nelle dress. It will be simple with no trim or buttons. I'm a little worried that this one will be a little big on her, but I went with the 4-5 size. Since it's not exactly winter wear (though I'm in California, so really, throw on some leggings and a sweater and it's good) it will be nice that she will certainly be able to wear it through spring and summer. I'm so amused by the environmental frog fabric she chose! Reduce! Re-use! Recycle! I bought these four orphan blocks at a guild fundraiser an eternity ago. They've been in a box forever and I decided it was high time to make them into something someone would enjoy. 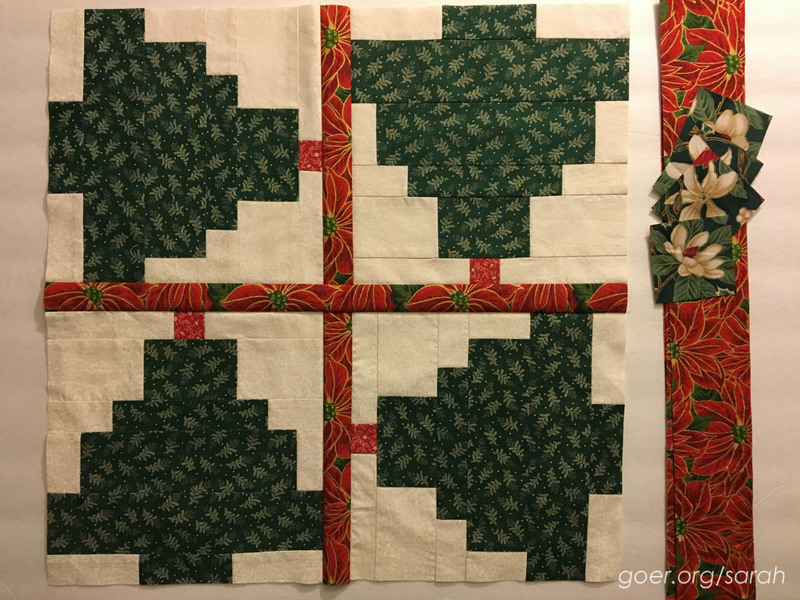 I'll be adding those wider poinsettia strips as an outer border, with those white flowers as corners (since the poinsettia fabric wasn't long enough to be a full border) to make a little table topper mini quilt. It dawned on me last night that it was December and my November do. Good Stitches bee blocks had totally slipped my mind. Oddly, since they were improv style, they were making me think a little more, so I had set the fabric aside early in the month. Since I finished and shipped my other bee blocks the first week of November, these just weren't on my radar. Ailish asked us to make improv symbol blocks and had some examples with arrows, hashtags, asterisks, etc. Here's my first one, which went together very quickly. I mostly just freehand cut with my rotary trimmer, then trimmed my block down to size (12.5" unfinished). For my second block, I decided to try something a little more tricky. I started with some 1 1/4" wide strips and this is as far as I've gotten. Any guesses on what I'm going for? Don't worry, I have a plan B if this doesn't come together as intended. 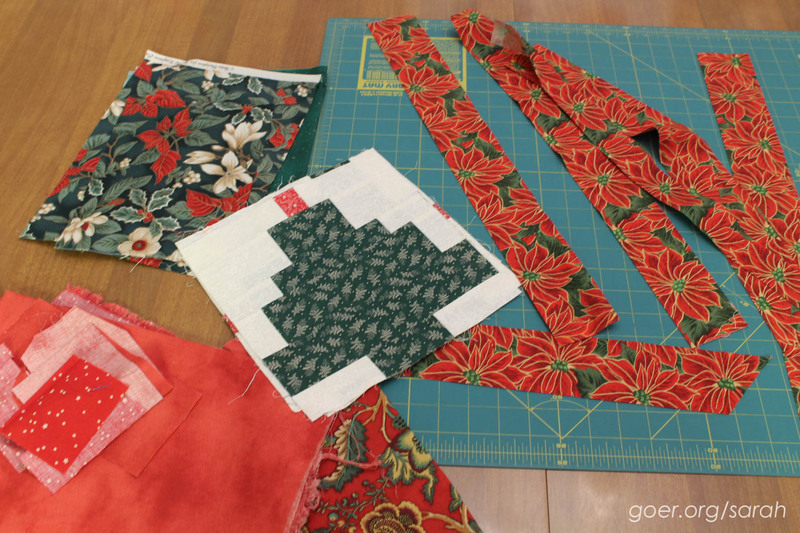 Oh see, I'm already using that leftover red fabric from the baseball shirt and dress! That makes eleven projects on my cutting/sewing table right now. 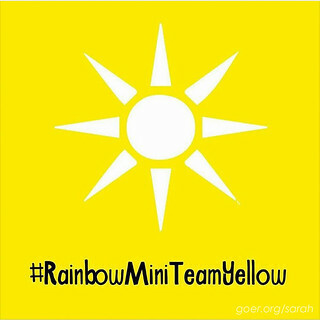 I'm also starting to think about what I'll be making for my partner in round two of the Rainbow Mini Swap on Instagram. I'm so excited to get started (though let's be real, I will probably wait until January to start any actual sewing). And, one more thing on my radar right now... I'm trying to get myself ready for my first broadcast on Periscope. It'll just be a little "All About Me" scope, and I hope to get to that in the next week. You can find me on Twitter and Periscope @sarahgoer. Follow me now to not miss my first Broadcast. For those of you new to Periscope it is a live video broadcasting app that you can download to your phone. As a live viewer you can interact with the scoper (person broadcasting) and other viewers through text messages, and you can "show the love" by giving hearts (similar to a "like" elsewhere in social media). If you miss a live broadcast you can catch it on replay through the Periscope app for 24 hours. Check it out! 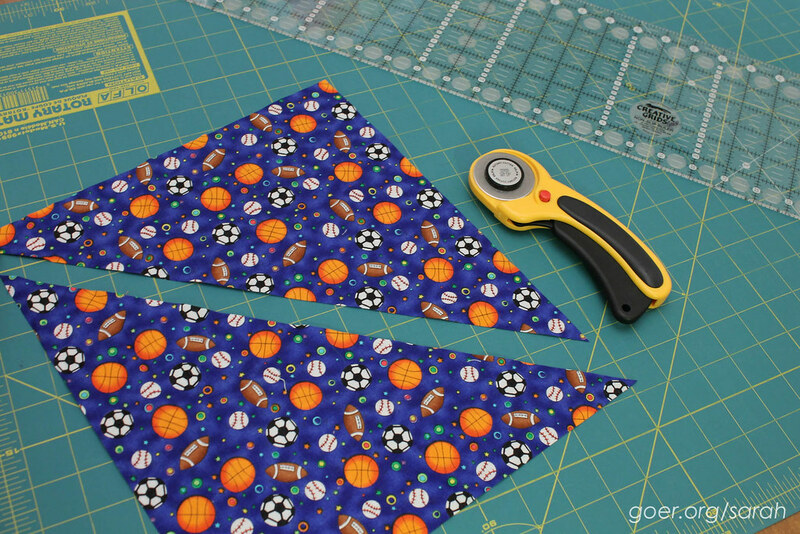 I'm linking up to WIP Wednesday, Let's Be Social, Fabric Tuesday, and Sew Cute Tuesday. Posted in Quilting, Sewing. 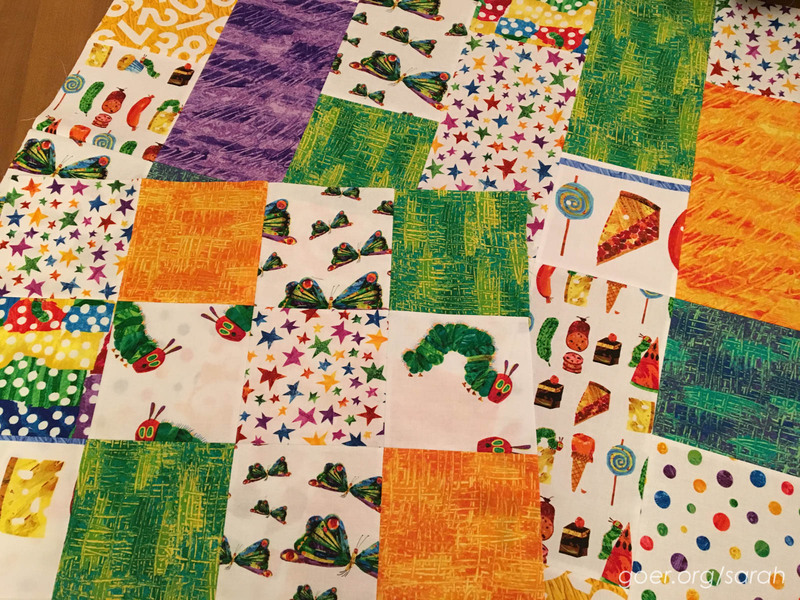 Tags: improv, kids clothing, mini quilt, sewing for kids, Very Hungry Caterpillar, WIP on December 2, 2015 by sarah. Wow Sarah, I am tired just reading this. Good luck clearing out some of the UFO's. Looking forward to seeing pics of the kids in their new outfits! Thanks, Bernie. I'll be sure to share once they are done. I too like to move among projects according to mood and idea; however, an occasional finish feels quite good. I really like the beginning design in the black/white/red wedge...I'l be watching for its reappearance. 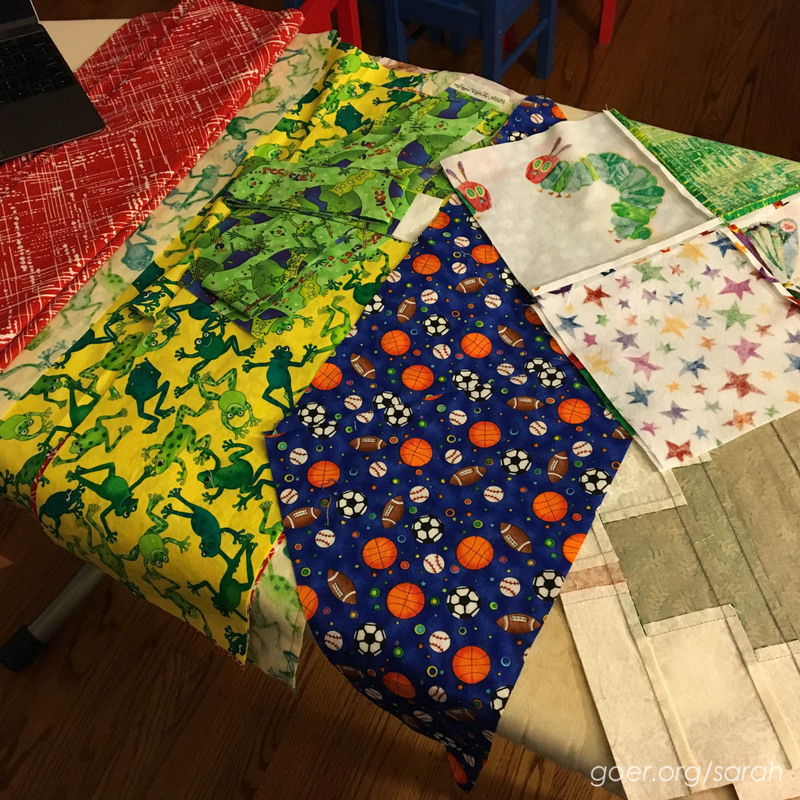 I'm ready to have some larger finishes after a bunch of mini quilts recently. Thanks for visiting, Claire. Look at you go! You'll get that WIP list knocked out in no time. My stumbling block is always getting it quilted. Unless it's small and I know how I am going to quilt it already, it gets nicely folded and sits in a pile for far too long. 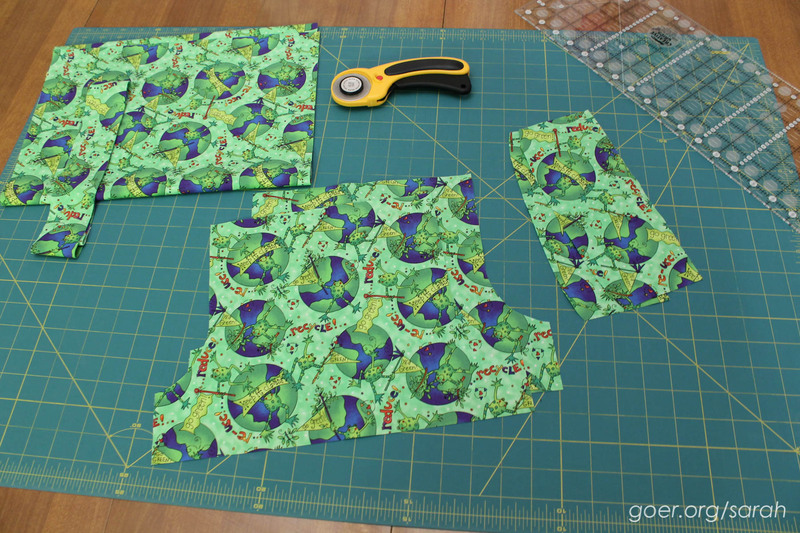 I do have two lap sized quilt tops that are waiting to be prepped for quilting. 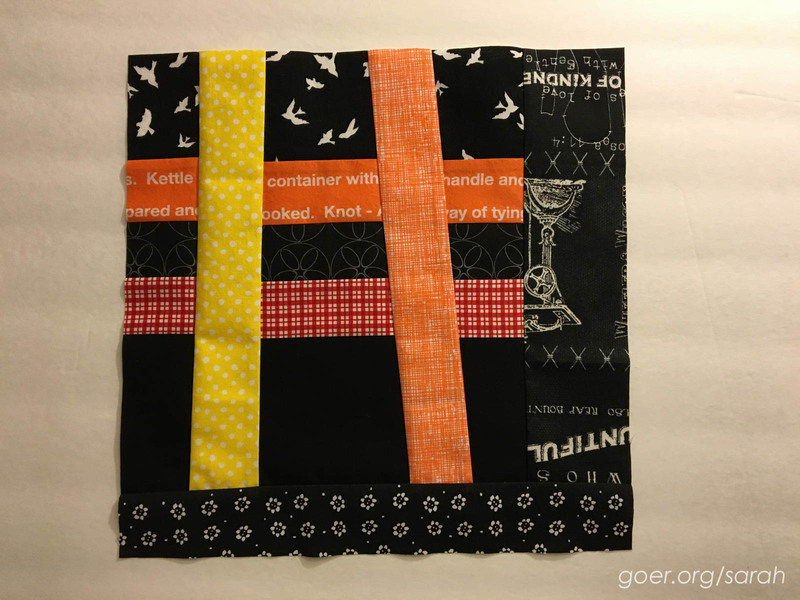 I think I'm doing all over graffiti quilting on one, but I might try using three different thread colors, so that will add a bit of a twist. The other will get some all over pattern, yet to be determined. At least the second top has only been finished for a month. We won't talk about how long the first has been sitting in a neatly folded pile. ;-) Thanks for visiting, Alison. Thank you, Lisa. I wasn't tired working on it, but writing it all out made me a little exhausted to think about it all. Maybe that's the difference of perspective. Nice to know when I was in it I was just enjoying the productivity. At the moment, I'm a bit stuck as to what to pick up next. Three hours until the kids are out of school. Gotta get a move on! You are one busy lady!! good luck to you. Good luck with your WIP's. I'm trying to work through my list as well. Nothing like a deadline to get you motivated. LOL Happy Hanukkah. Indeed! Thanks for visiting, Anja.